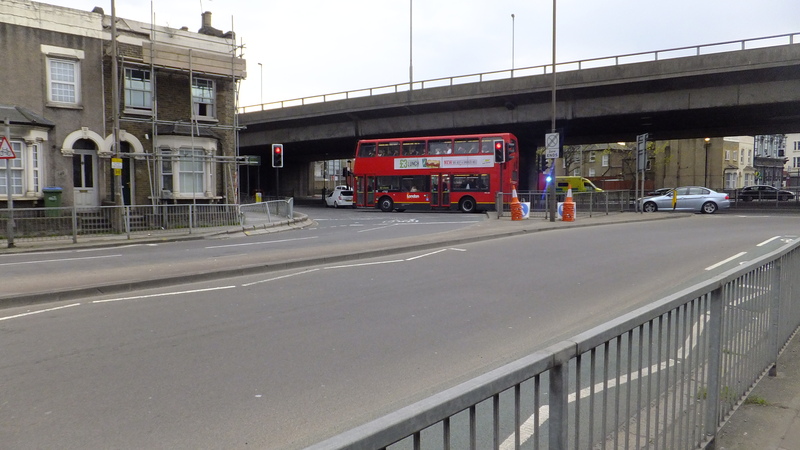 A petition has been launched to improve the notorious Woolwich Road roundabout in Greenwich after the recent death of a cyclist. The area was originally in line for an upgrade as part of two schemes that have subsequently been cancelled under Mayor Sadiq Khan. Cycle Superhighway 4 has been curtailed at Greenwich instead of running through to Woolwich from Tower Bridge and the Better Junctions program has removed the roundabout from its plans. The latest death was the second in a week in Greenwich. The Silvertown Tunnel was recently approved by Transport Secretary Chris Grayling. Aside from forecasted housing numbers being out by thousands and admitting that there are “inevitable significant uncertainties in traffic forecasting and modelling”, approval documentation declined to award money to specifically mitigate impacts on Greenwich nor address this roundabout. In coming months a 1,600-pupil school opens on the Peninsula. Numerous other attractions are also planned in coming years such as a 4,400 capacity music venue and various hotels, as are thousands more homes and shops such as Ikea. Links between east Greenwich and the Peninsula continue to be very poor. I wish they hadn’t used 38 Degrees as that lacks legal power, why didn’t the organiser start it on the official parliamentary petitions site https://petition.parliament.uk/ That way the government must respond over a certain amount of signatures. It’s too late to start one there now as people will wonder why they’re being asked to sign two. Sorry to be negative, it’s a good idea but it seems like we’ll be signing our names on the wind. It’s not something for parliament to worry about. It’s for Tfl and the RBG to sort out surely (I stand to be corrected). The thing is, I don’t know if a roundabout would work, I’m not a road expert. All I know is that the junction is dangerous and needs looking at by people who know about these things. As well as being dangerous for bikes, it’s also bad for pedestrians. Drivers keep going through the pedestrian lights on the slip road out to Kent when it’s green for pedestrians. I can’t believe no pedestrians have been hurt. Drivers just don’t realise there’s a pedestrian crossing there. I see it almost every time I use the crossing. My worry is they’ll prioritise cars and close the crossing altogether. What they need to do is close the slip road and encourage traffic to go another way. You’re right about the pedestrian lights at the slip road. Drivers turning left onto the slip road usually see the lights but often drivers beating the previous set of lights coming off the peninsular just whizz through them. The junction needs improving for all users. I’ve used this junction as a driver for nearly 25 years. It’s far from perfect but it does actually keep traffic moving relatively well, as long as correct lanes are kept. It’s not a junction I’d like to use as a pedestrian or a cyclist, maybe the best and safest bet for cyclists and pedestrians is a diverted route/bridge or even a tunnel be looked at to remove them from having to use the junction entirely? Enforcing the law would be a good start to help pedestrians. I’ve no sympathy for drivers here, given so many of them break the law. If RBG started fining drivers who jump that red light they’d get dozens a day. We need to keep this junction for local traffic and encourage/force through traffic and HGVs onto the Blackwall Lane roundabout. My worry is that they’ll take the easy decision and make it harder for pedestrians. Has anyone seen the proposals?